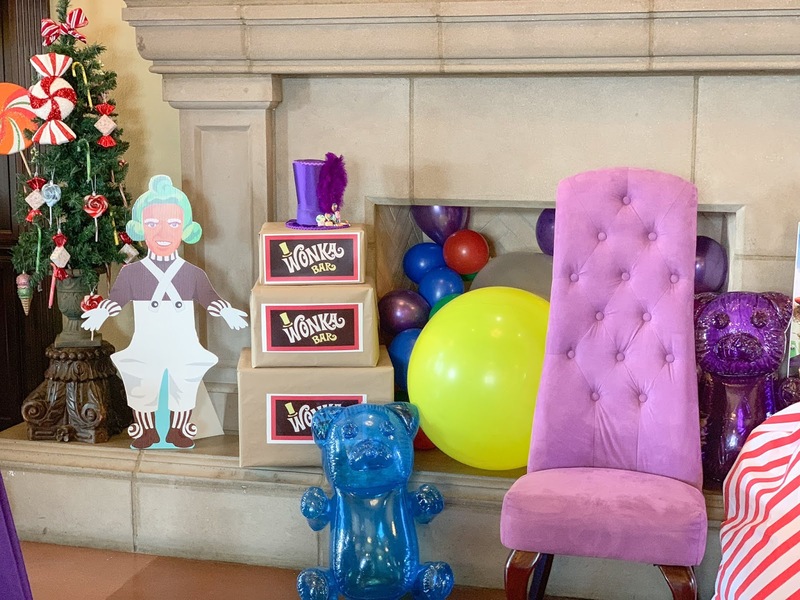 It's been a whirlwind of a weekend as we hosted our son's 1st birthday party WONKA style! The Willy Wonka and the Chocolate Factory 1971 movie is one of my husband and I's favorite movies, not only because I remember watching it as a kid and wishing there really was a chocolate factory to visit but also because it has a lot of great messages (even if they are delivered in a sarcastic manner by the late and brilliant Gene Wilder). Above all the messages, I just loved bringing it back to our imaginations where we let our creativity bring this theme to life! 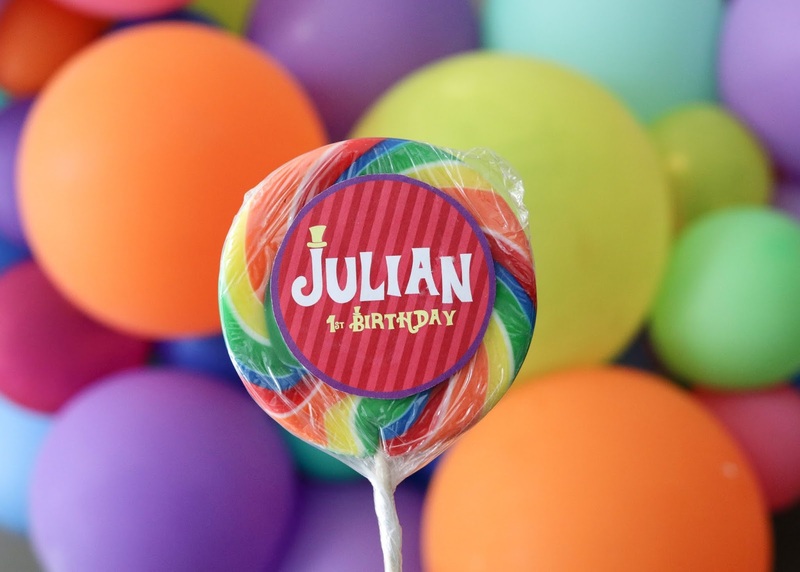 Wonka is a party theme I have wanted to do even before Julian was born and quite honestly I was surprised it wasn't done more often! 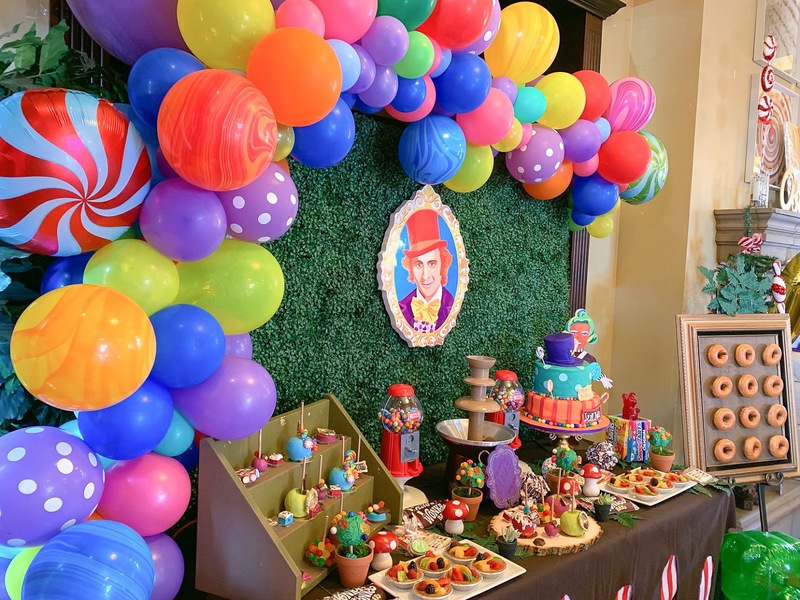 Maybe it is because you can do SO much with the theme that it could be overwhelming, but I knew who could help me execute it: My sister and her best friend, dessert maker extraordinaire @MKRCreations. 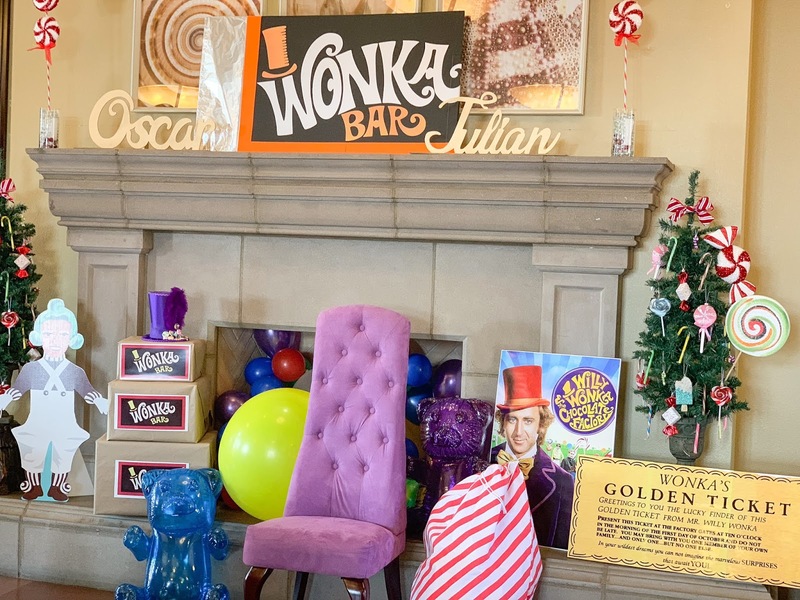 'Cause I've got a golden ticket I've got a golden chance to make my way And with a golden ticket, it's a golden day! 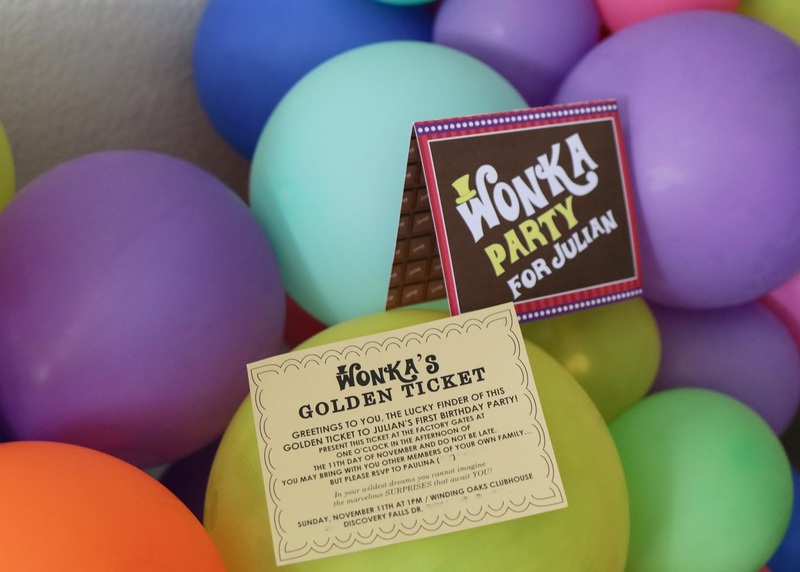 For the invitations, I really wanted to send out actual chocolates with the golden ticket inside, but seeing as it is hard to mail chocolates because they can break or get greasy I asked my friend Roxy if she could create an invite that resembled opening up a Wonka bar with the golden ticket inside (I mean how can you not have the golden ticket be the invite?!) and she knocked it out of the park, or chocolate factory so to speak. 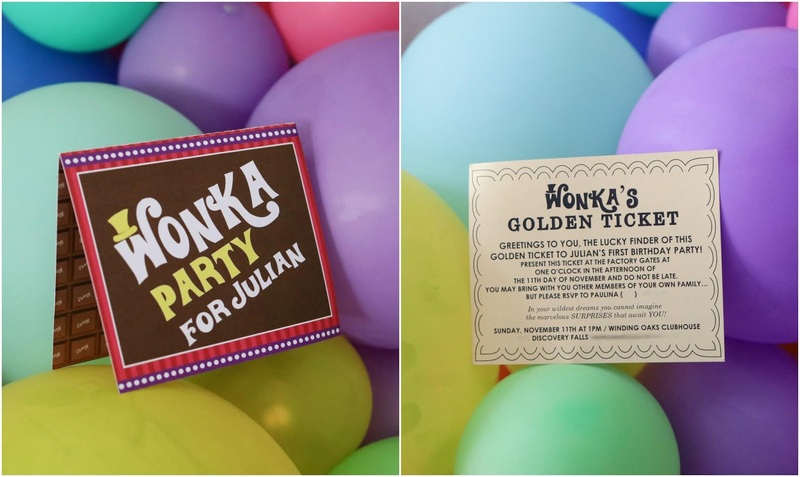 I also wanted the ticket to have the same wording as the movie's ticket which most people, especially those who have seen the movie understood, but my apologies to the couple of people who didn't get the Wonka sarcasm! My response to that was "haven't you watched the movie?!" 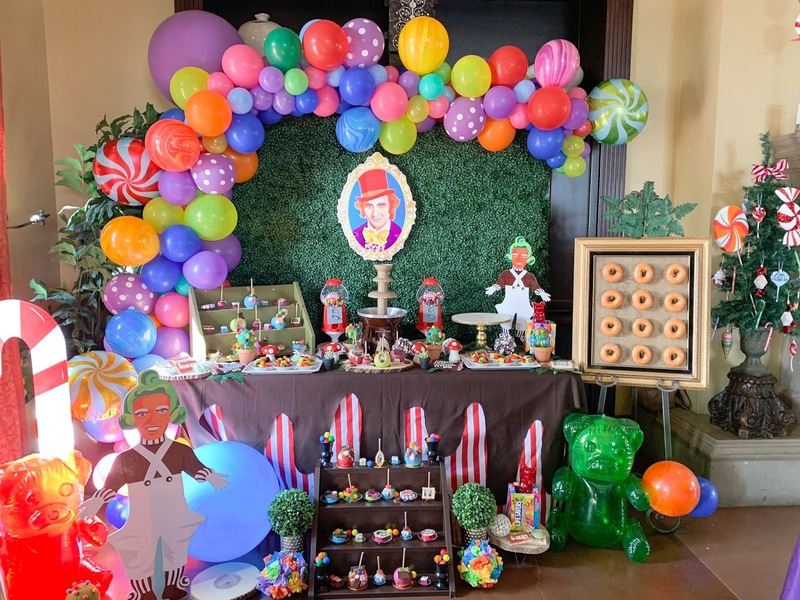 For the main dessert table, I wanted it to be the dessert version of the famous candy forest scene in the movie and the final product exceeded my expectations! 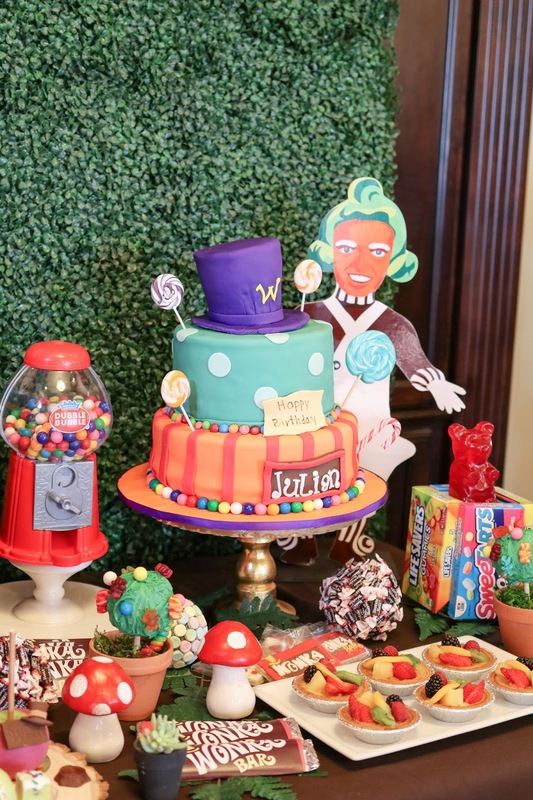 It was styled by my friend's @MKRCreations and stocked with the cake from the same cake lady who made our wedding cake (c/o my Mother-in-law and Sister-in-Law). 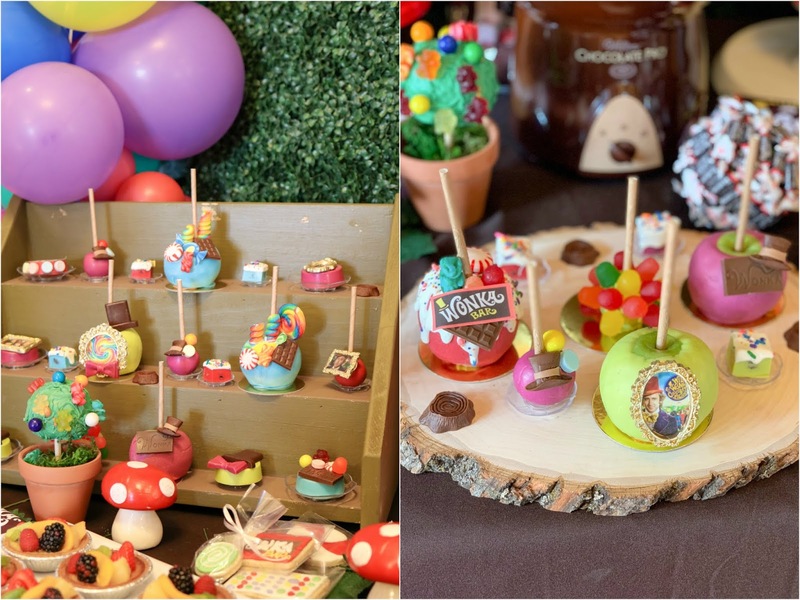 I was SO impressed with the the details on the candied apples and the treats (by @MKRCreations) and in the famous words of Wonka himself, they were edible! 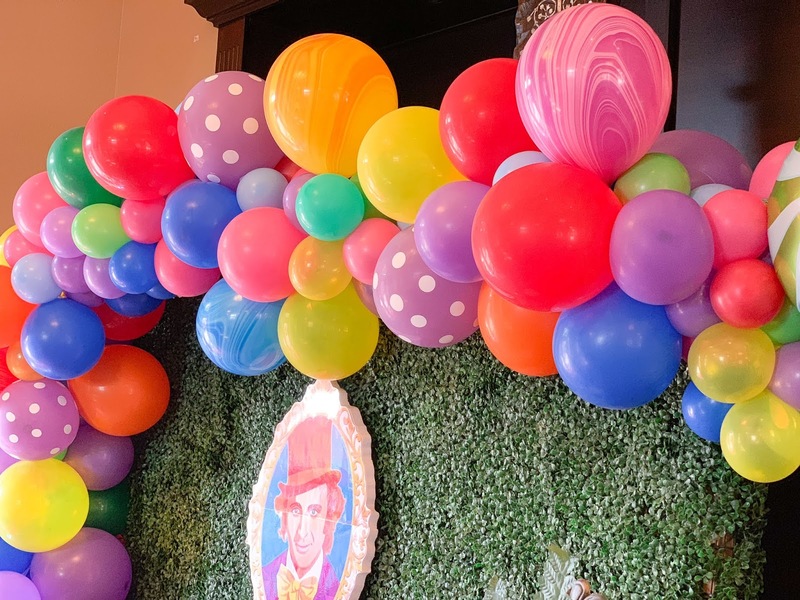 The greenery we used for my baby shower made another appearance again (and many of you have shopped it, so I'll link it here), but this time my sister commissioned @CraftyDesserts to create a balloon arch that resembled candy and in beautiful vibrant candy colors as well as added some DIY's to the decor. I have said it before and I'll say it again, my sister is a party God-send! 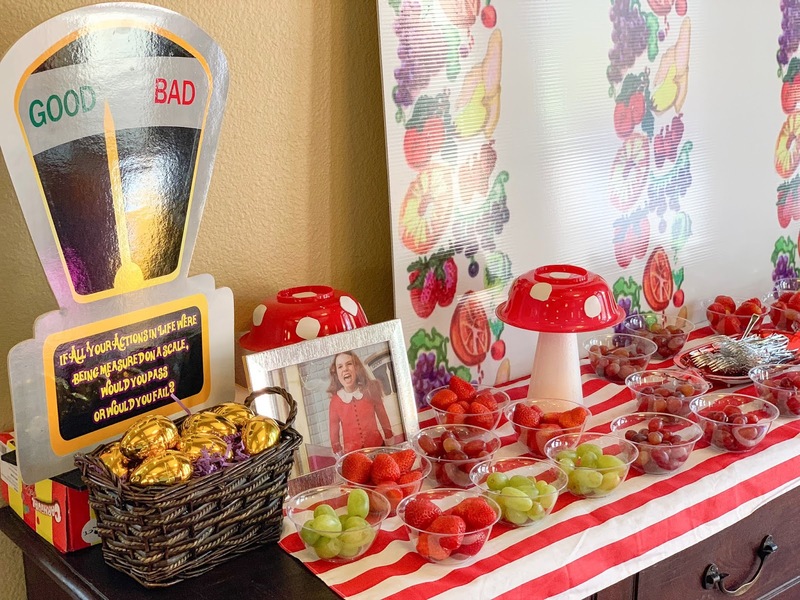 Sprinkled around the room were pictures of classic scenes from the movie, one of them being the infamous lickable wall paper scene and a snippet of the golden eggs scene where Veruca Salt makes her exit through the bad egg shoot. 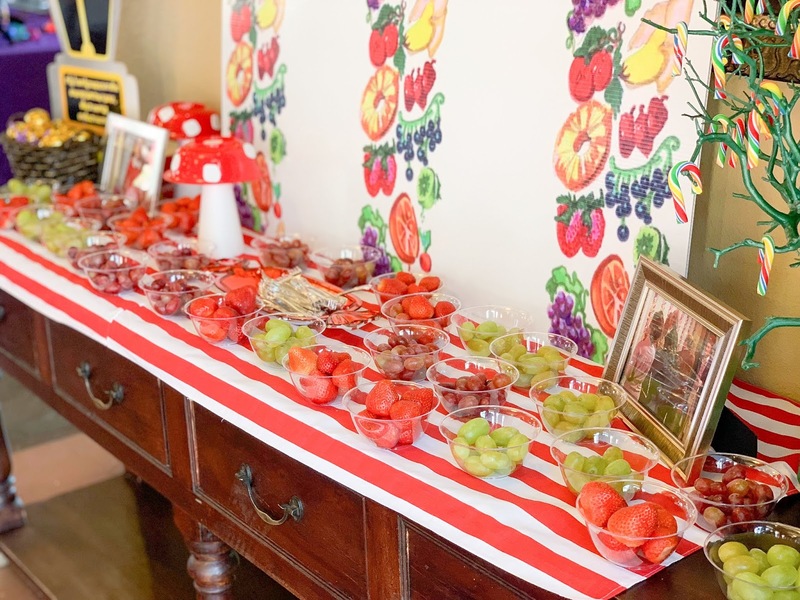 The fruit table was a great idea from my sister who got the same wall paper design printed out in a large board only this one wasn't lickable, but it did have fruit plates to match, thanks to my mom who put the fruit out in this cute way. The day of was definitely a blur, but overall it felt like everyone had a good time, or at least the kids did! I wanted to have enough activities to entertain them so I got a bouncy house and a face painter aside from the piñatas. And for the adults, what better way to entertain them than with food?! 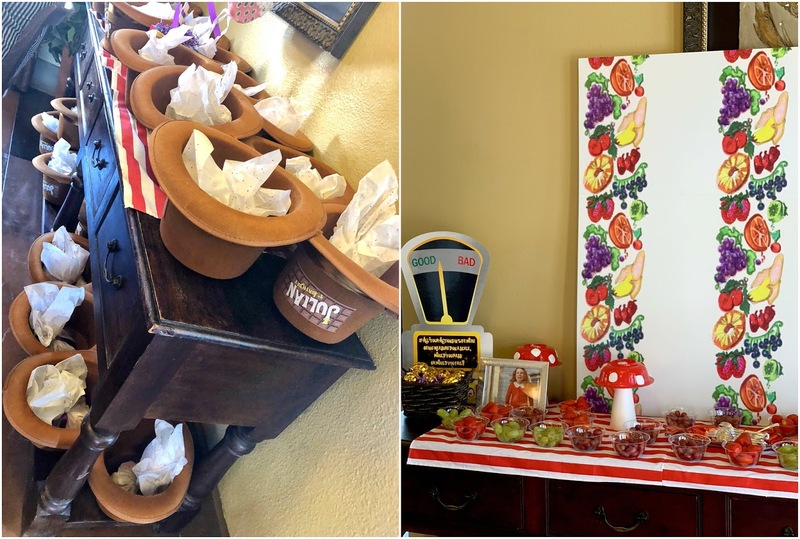 We were blown away by the RSVP's (and we realized we have lots of fam and friends) that we decided to get a tostiloco bar (as an appetizer) and a taquero to cater because I mean who doesn't love tacos?! Plus I knew it was way too many people to have my husband grilling the whole time (which he initially wanted to do, bless his heart). I was just so thankful that everybody came out and had fun! Willy Wonka: And Charlie, Don't forget about the man suddenly gets everything he ever wanted. Charlie Bucket: What happened to him? 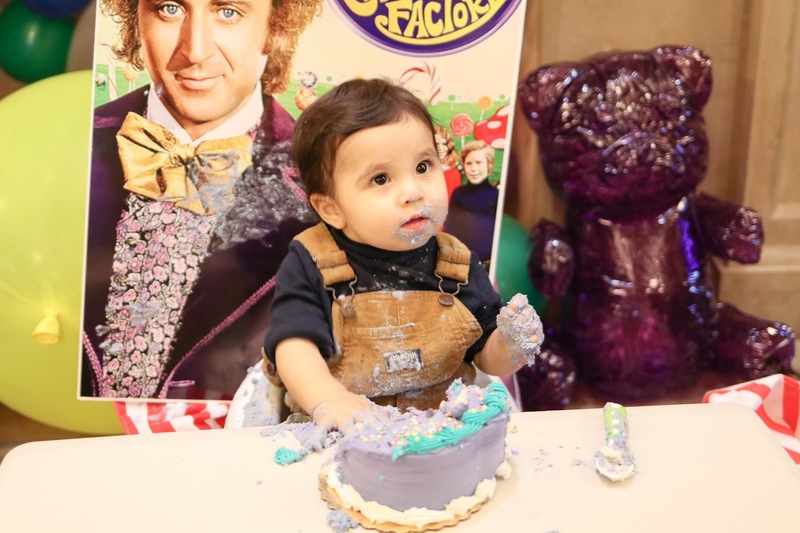 Willy Wonka: He lived happily ever after. It's hard to link up decor because a lot of it was put together from so many different places. We combined Christmas Decor with Dollar Tree finds with rentals with customized printables (again creativity is key! ), but anything that was online I have provided below. If you have any questions or are throwing a similar party feel free to ask me! 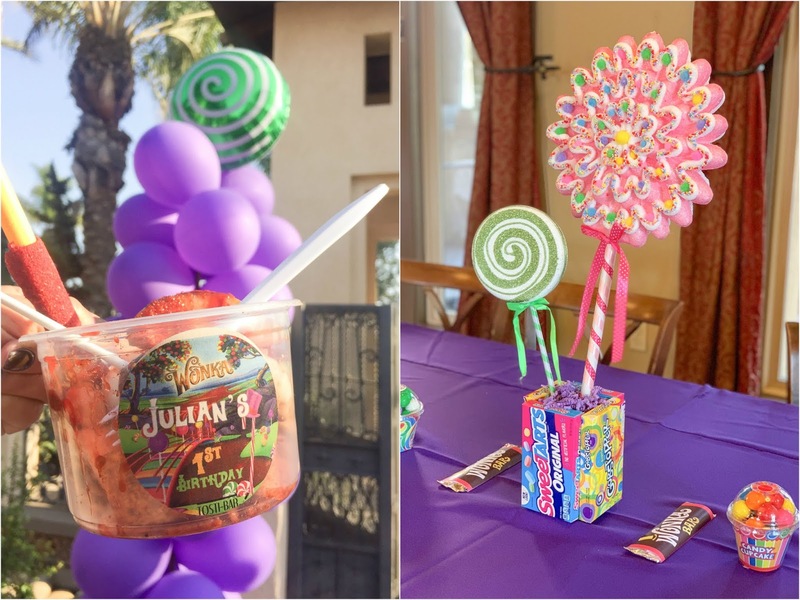 And if you are in the San Diego area and are looking for desserts like the ones pictured, I highly recommend my friend Beba, from MKR Creations (you can DM her here). Oh my gosh, this is so so cute! What a fabulous party. 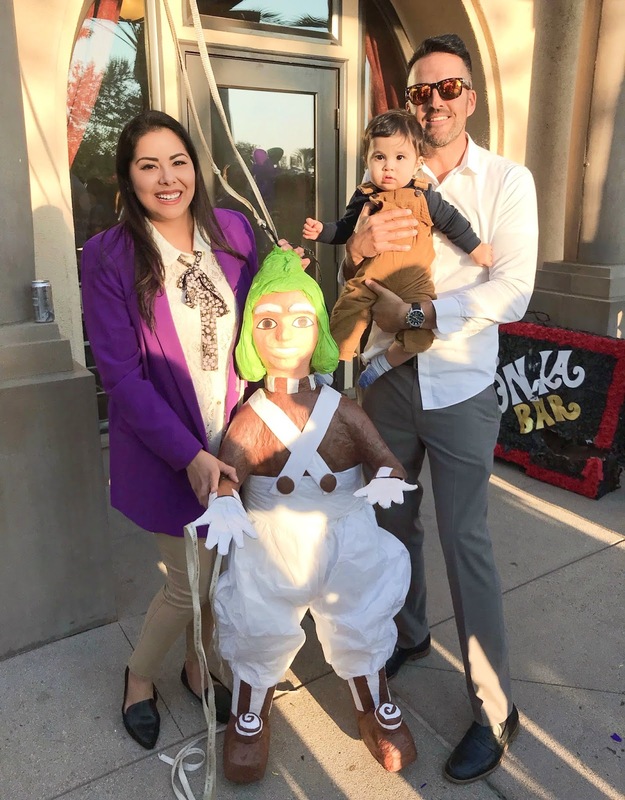 I remember the movie and almost every kid has wished to go to that chocolate factory once. The party looks super cool and amazing. 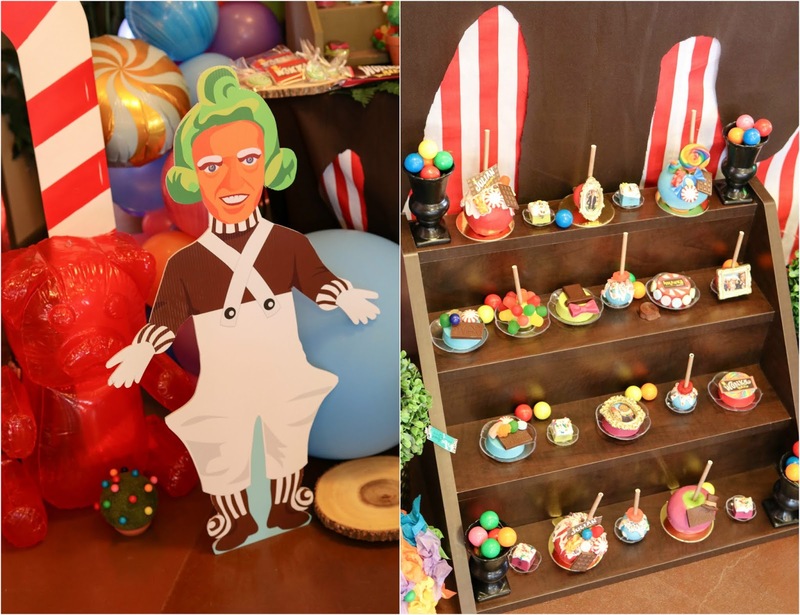 Kids love this kinda parties, chocolate & cake parties. 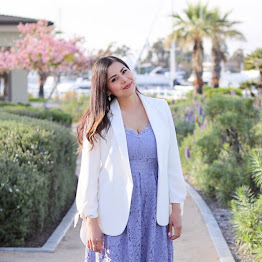 Thanks for sharing your happy moments! Thinking of planning the same for my l'll brother.